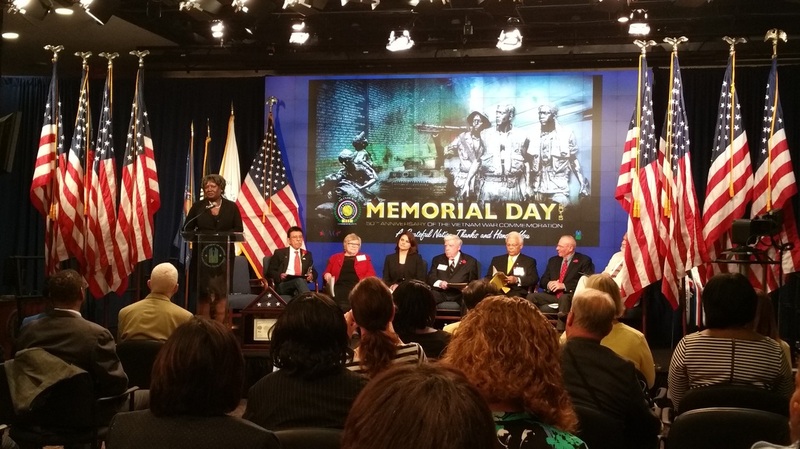 May 21, 2015: Fannie Woods, retired Air Force officer and current U.S. Department of Housing and Urban Development employee, speaks at their Memorial Day Commemoration and 50th Anniversary of the Vietnam War Commemoration Ceremony. AFSA representatives Morgan Brown and Steven Zalesky were in attendance. May 22, 2015 -- The annual National Memorial Day Observance to honor America’s fallen military service members is scheduled for Monday, May 25 at Arlington National Cemetery. Often lumped together with Veterans Day due to similar demographics as well as public perceptions, it is important to keep this one fact in mind: Veterans Day is meant to recognize those veterans who have returned to us; Memorial Day is meant for remembering those who made the ultimate sacrifice. In keeping with our history, AFSA will be attending or participating in a number of special Memorial Day Observances in the National Capitol Region. The first event took place May 21, as AFSA Division 3 President Steven Zalesky and AFSA Director of Military & Government Relations Morgan Brown attended the annual Housing and Urban Development Memorial Day Commemoration Ceremony and the 50th Anniversary of the Vietnam War Commemoration. The Air Force Association and the Air Force Sergeants Association invite the public to join their commemorative Memorial Day wreath-laying ceremony May 25 at 9:00 a.m. at the Air Force Memorial. This annual event serves as an opportunity to recognize and pay tribute to the many service members who have died in service to this nation. Several wreaths will be placed at the Air Force Memorial on this day of remembrance in honor of the many generations of military heroes. Chief Master Sgt. of the Air Force James A. Cody will be the keynote speaker at the ceremony. AFA Acting President Maj. Gen. (Ret.) Mark Barrett and AFSA Chief Executive Officer Chief Master Sgt. (Ret.) Rob Frank will also speak on behalf of their associations, as AFSA Chief Operating Officer Mark Stevenson will be attendance. At 11:00 a.m., AFSA International President Dan Yeomans and Deputy Director of Government Relations Scott Porter will attend the Presidential Armed Forces Full Honor Wreath-Laying Ceremony at the Tomb of the Unknown Soldier, followed by an observance program hosted by the Department of Defense in Arlington’s Memorial Amphitheater. At approximately 12:01 EDT, IP Yeomans will lay a wreath before the Tomb of the Unknowns on behalf of the members of AFSA. Finally, though your weekend plans may include travel and gatherings with friends and family, make plans now to participate in the National Moment of Remembrance. Please pause from whatever you are doing for one minute at 3:00 p.m. (local time) on Memorial Day in honor those who died as a result of service to this nation.